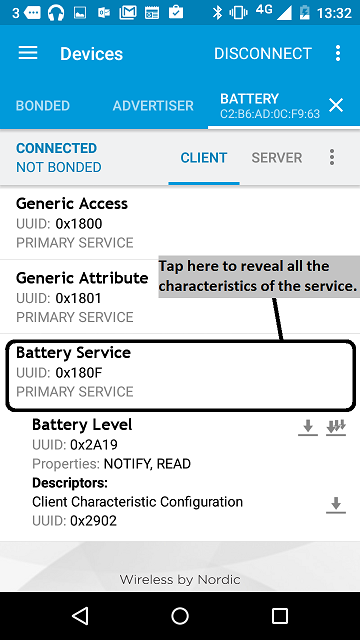 The [battery service transmits](https://developer.bluetooth.org/gatt/services/Pages/ServiceViewer.aspx?u=org.bluetooth.service.battery_service.xml) a device's battery level in percentage, with 100% being a fully charged battery and 0% being a fully drained battery. - [nRF Master Control Panel](https://play.google.com/store/apps/details?id=no.nordicsemi.android.mcp) for Android. Hardware requirements are in the [main readme](https://github.com/ARMmbed/mbed-os-example-ble/blob/master/README.md). Building instructions for all samples are in the [main readme](https://github.com/ARMmbed/mbed-os-example-ble/blob/master/README.md). 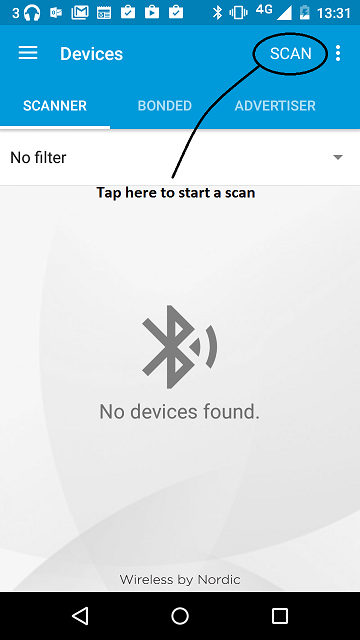 **Note:** Screens captures depicted below show what is expected from this example if the scanner used is *nRF Master Control Panel* version 4.0.5. If you encounter any difficulties consider trying another scanner or another version of nRF Master Control Panel. Alternative scanners may require reference to their manuals. 1. Build the application and install it on your board as explained in the building instructions. 1. 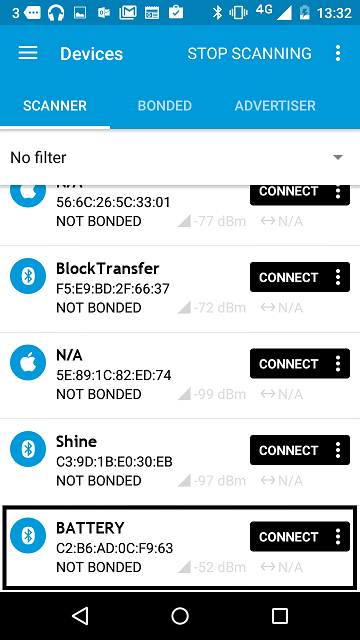 Open the BLE scanner on your phone. 1. Find your device; it should be named `BATTERY`. 1. 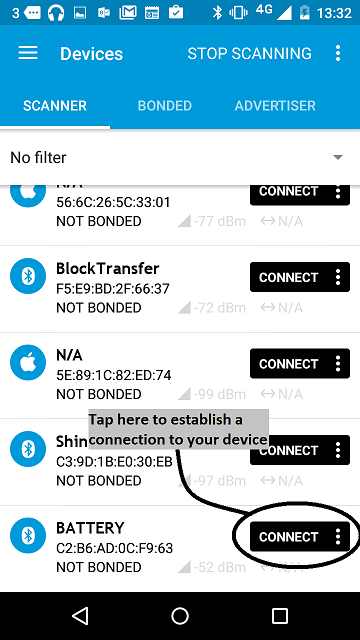 Establish a connection with your device. 1. Discover the services and the characteristics on the device. 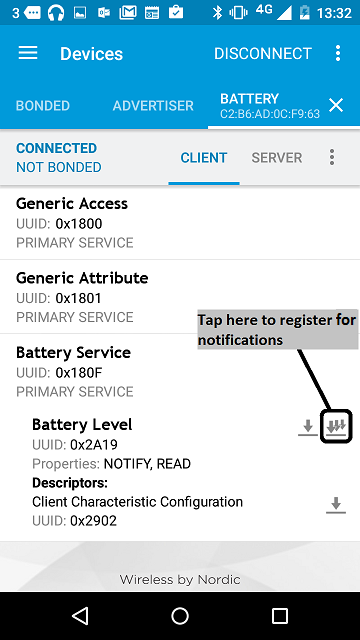 The *Battery service* has the UUID 0x180F and includes the *Battery level* characteristic which has the UUID 0x2A19. 1. 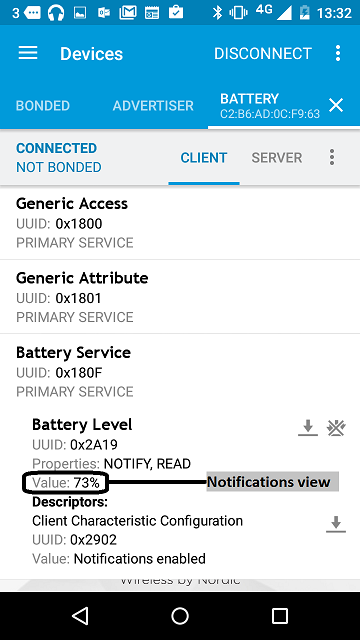 Register for the notifications sent by the *Battery level* characteristic. 1. You should see the battery level value change every half second. It begins at 50, goes up to 100 (in steps of 1), resets to 20 and so on.